And not all the advice you get regarding the cap table from websites or simple blogs are right. This is also one reason why Eqvista has brought in the idea of the cap table platform, so that you do not have to worry about keeping the cap table updated. After reading up on basics of a cap table, are you ready now to dive into creating one on your own? Well, other than the basic idea of what makes a cap table, there are lots of other points that have to be kept in mind. And not all the advice you get regarding the cap table from websites or simple blogs are right. This is also one reason why Eqvista has brought in the idea of the cap table platform, so that you do not have to worry about keeping the cap table updated. But the application would not do all your work, there are still things that you need to follow and keep in mind. As said by many successful entrepreneurs, “If you think getting good advice is expensive, you have never paid the price for bad advice.” This is very true for keeping the cap table updated and clean as the cap table is a part of the DNA of your business. The composition of a cap table can tell a lot about what the company can do, who has parts of the company and who makes the major decisions of the company. Hence, it is vital to understand your responsibilities towards your company and how specific changes can impact the business, from the start of the business till your exit. Make sure to update the cap table every now and then, if there is a new round of financing, or even if you are about to issue more share options. Despite all the straightforwardness of the document, there are many who tend to make mistakes. One major mistake is that many entrepreneurs still rely entirely on spreadsheets for managing their cap table and this can make everything disorganized and complicated. When a company gets funding and grows, the current spreadsheets available are not enough for keeping the cap table proper, especially among a lot of people simultaneously. Moreover, as the company expands into new horizons, everything in the cap table would become more complex. And with even a little mistake, everything can go wrong and cause a lot of issues both for you, your business and with those who are working with you in the company. Let us understand what exactly we are talking about when we say avoid mistakes in a cap table or use the software made by Eqvista to keep your cap table in place. This article would give you all the insights needed to understand everything in depth. Why keeping a correct update cap table is important? To make better decisions, the founders of the company need to invest time in setting the cap table and detail all the information in the table to ensure that the intricacies of the company are in place. With the help of an updated and organized cap table, the existing owners would be able to determine the percentage of the company that they can give to the investors when obtaining funding. This is important as you would not want to reduce your control over the company by blindly handing over a huge percentage of the company without having all the proper details. During an audit of the company, a well-managed cap table would help your lawyer to review the history and holdings of the company with the most accurate, well-detailed and organized information. Further, with a complete view of the historical insights of the company’s shares and ownership control, it would be easier to negotiate the current valuation of the new fundraising steps for the company. The employees that have equity stakes or options would be able to see the real-time values of what they hold. If you are searching for new investment, investors would also like to have a look at the cap table. They would want to see who has control of the company, and to determine the possible dilution and payouts under particular situations. An updated cap table would allow potential investors to decide how much leverage and control could be declared during negotiations. Not only it is beneficial to keep the cap table updated, it is also important as there are many consequences if you do not pay enough attention to the cap table. 83(b) election concerns the tax treatment of restricted stock awards, and it is vital to have it filed within 30 days of the grant. Rule 701 is an exemption from being obliged to file with the SEC to issue equity compensation. ASC 718 (formerly known as the FAS 123R) is an accounting requirement to measure and record the cost related to issuing equity-based compensation. IRC 409a laws demand a formal valuation of the company that should be done at least once a year to decide a proper strike price for options that would be recorded in the cap table. ISO $100k limits designate how many options can vest in a given calendar year to qualify for specific tax treatment. All these details are known only if the cap table is up to date and there are no major errors. In case any of the above compliances are not followed on time, it can cost the founders, shareholders and even the employees a lot. Hence, it is vital to update the cap table on time and follow the obligations. Many entrepreneurs make the mistake of merely finalizing the deal for equity with just a handshake and forget to record the details of the agreement in the cap table or even in the company records. Many people are indeed true to their word, but people tend to forget things and memories fade away. This would eventually cause a misunderstanding between you and the investor or shareholder. This is one reason why it is better to have an application on your phone or laptop for the cap table and add in the details as soon as the deal is made. If you are not near any of the devices, you can write the main details on a piece of paper to record it later in the cap table. In short, do not rely entirely on verbal agreements. The moment all the co-founders sit together to make their business become a reality, everyone would have grand visions of the future. But not everyone stays the same or has the same vision forever. There is usually at least one person who would change their mind later on for some reason or another. And when this person changes their mind, they would wish to part on good terms from the company and their duties. But this does not always happen and it is better to be prepared for any case scenario. At the end of the day, you do not want a large equity holder to stop contributing to the company. So, it is better that most of the shares for the founders should vest over many years. Basically, vesting here means that the shares of the company are earned over time. In case one leaves the company before time, that founder would have to abandon any unvested shares. It is almost the same as obtaining payment every two weeks for a yearly salary, where the salary is decided beforehand. The only thing here is that it would be paid until the person works in the company and all these updates HAVE to be made in the cap table as well. A lot of founders do not take out time from their schedule, or just don’t know how they need to represent the impact of the new funding round of the shares accurately in the cap table. There are terms like participation caps, participation rights, and even liquidation preference that you would come across in a cap table. If you have no idea what these words are, you should take some time to get familiar with them. Moreover, a lot of the entrepreneurs have unknowingly given a higher value when negotiating the terms, even though many might have just made a mistake due to ignorance. And with the right tools like the new applications that use a platform for the cap table, this can help you avoid such mistakes and understand the terms better. Making a wrong decision can cost you business. Incentive stock options, or ISO’s for short, can offer the option holders with advantageous tax treatment. In short, when options are used, no taxes have to be paid by the employee, and the only time the tax would have to be paid is when the stocks are sold. The holder of the shares would pay long-term capital gains taxes, which means low tax rates, in cases where the shares are held for over a year. Nonetheless, if the options are used after the company is sold, the tax would be higher as the holder would get the income instantly after the options are used, making them pay ordinary income taxes on it. The tax rate here is normally 35%, which is why it is advised to use it before too late and note the details down. Note: The stock must be at least two years from the grant date of the first option to qualify for the long-term capital gains. The idea of getting a lot of funds to run your business can be enticing but is advised not to take an amount that is more than what you actually need. This can make you lose your entire company since the ownership control would go to outside shareholders. Hence, it is important to have a properly updated cap table from which you can decide how much investment is the right amount, while maintaining the majority control of the company. Keep in mind that getting a large amount would not suddenly make your business successful. You only need a positive amount of cash flow till the business can earn that much by itself and pay the bills. And to avoid getting a larger amount even by mistake, you need your cap table read and up to date. Create Cap Table in Minutes! If you are a business owner or professional, you can start creating your cap table and manage it online. Try out our Eqvista App, it is free! When you have to cash out the equity to equity holders, the cap table is the thing that would help you determine who gets what. The cap table would also hold all the legal records, agreements, and documents that would be needed every now and then in the business life cycle. Let us say that you have already made a cap table and placed all the records in a spreadsheet. And now you need a lawyer to help you in using the cap table to determine how to distribute the shares. Well, due to the limitations of storing the data this way, the lawyers may not be able to help you with everything. It would take a lot of their time to figure out what is what. Failure to do this would lead you to have inaccurate details or a miss out on certain details. This would lead you to make a wrong decision and eventually lose business or a lot of money if you take professional help to rectify the cap table later on. As shared before, using your options late would leave you to pay a lot more taxes. And if the options are not exercisable early, you might not have an option at all. Early exercisable options mean that you can use the unvested options and add them in the restricted common stock. Let us say that you have just 25% of the 1,000,000 options that are vested for you currently. This means that your business has a genuine possibility of exiting in one or two of the coming years. But if you choose to exercise the options now for obtaining the low tax benefit, you would have just 250,000 that qualifies. You would be able to use the shares as they are vested. But there would come a time where you would start exercising within a one year gap, and those shares would be taxed higher. On the other hand, in case your options are exercisable earlier, you can use all the unvested and vested options at any time. These shares would have a low tax rate after about a year or two. Additionally, it again is very important to note all these details in the cap table and not just leave it written on a paper or in your head so that you know when you get back to them. The moment you negotiate a term sheet, it would normally have the requirement for an option pool distribution, which is expressed as the percentage of the cap table. Nonetheless, whether this percentage is determined prior to the (pre-money) investment or after the (post-money) investment makes a lot of difference. In case you want to remove 10% of the cap table for the options pre-money, this would mean that the current shareholders would get diluted by the pool of the options. In short, in case you wish to incentivize people to grow a successful business, the current shareholders would need to give up a little equity. But in this process, the new shareholders would get the benefits. If you do not issue all the pool options, you would have given the new shareholders more shares than what they invested for. So, if you have to remove the option pool pre-money, ensure that you issue all the options to obtain the entire value of the pool and also make the notes in the cap table when you make a decision. As per the IRC 409a laws, issued options have to be given with the price equal to or higher than the market value of the stock. In case you issue the stock with a low cost, it would result in hold-ups during an IPO or an acquisition, excess expenses incurred by the business, and even harsh tax penalties for employees. Moreover, if you grant the options at a high rate, your employees would not get the value on which they could have got it for. This activity is biased as the valuation of the startup shares is more of a theory. But to ensure you get it right, you need to get the 409a valuation with a reputable valuation provider. This would help you avoid any mistakes since the firm would help you set the strike prices low so that you can offer a reasonable incentive, yet justifiable to audit firms, the SEC and the IRS. For the 409A valuations, Eqvista is the right place for you. Failing to seek professional advice. Even with the internet full of resources, never underestimate the advice of a lawyer, accountant, mentor or investor. It is better to spend a hundred or even a thousand dollars more to make the cap table fall in place, instead of regretting a decision later on due to ignorance. Now that all the common cap table mistakes are clear to you, one of the main problems that many people still make is using an outdated spreadsheet for maintaining a cap table. Even though Excel is an affordable and powerful tool, there are a lot of drawbacks, which might not help with a proper cap table at the end of the day. One of the main frustrations for many who have tried working with an Excel sheet is the amount of time they have to spend on maintaining the cap table. Additionally, there are many instances where the information of the members of the board of directors, employees, owners and even the investors are not accurate. These mistakes might seem small, but they can cause a huge loss for you and your company overall. In today’s world where technology has taken over every place of our lives, it has also helped us to make capitalization table maintenance and preparation easier. Fortunately due to the speed of innovation, other than the Excel spreadsheets, a new option is on the market which uses the latest technology. Cap tables using latest technology has made things easier for entrepreneurs to keep track of all their details and has also helped to reduce the risks of recording an improper transaction. It also reduces the headache in maintaining spreadsheets, where you can also have all the complex calculations done for you. Other than this, it would help you understand things better, where you can make the right decision in the least amount of time. As the company grows and becomes complex, this application would work to make things easier for you. You would be able to add details and alter things just when your company is started. Eqvista & How it can Help? As mentioned above, a lot of the small business entrepreneurs tend to start with Excel sheets for creating a cap table. And even though it can work well for you in the beginning, the details quickly become complex as the company grows and business picks up. This is the reason why it is advised to use Eqvista’s software at the beginning so that you do not miss out on anything. It would also help you to avoid spending extra time on re-doing the complete cap table when things become complicated, and you decide to move from excel to the software designed for cap table management. With the help of the our database, things have become easier for every entrepreneur. Eqvista uses technology to make the best application that can help you at every moment, where you would haven’t have to spend hours adding details and maintaining the cap table. All you would need to do is add the details when a deal or update is made. Manage Your Cap Table Efficiently With Real-Time Updates & AnalysisGET STARTED, IT’S FREE! In short, you would not have to suffer from most of the cap table mistakes like inaccurate details, or an outdated cap table. You would be able to easily rely on this application that would work as the single cap table document to determine the equity holders of a company and their applicable rights and obligations. 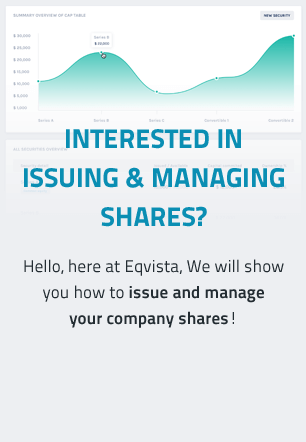 You may be wondering why choose Eqvista, when there are many other companies in the market? Well, Eqvista’s professionals have made sure that the end product is something that would do wonders for you and your company. This application uses the most updated technology, and helps you have your business prepared for the future. In short, you can save time from maintaining the cap table and feel secure about the information you add there. Want to know more? Register now!